While touring around San Telmo in the old neighborhood of Buenos Aires, there are several interesting architectural landmarks that should be taken into account to enjoy the best sight possible. Heading from Puerto Madero up to Defensa St and then all around the historical blocks of Carlos Calvo and Humberto 1, we will then head over towards the gorgeous Lezama Park to end our first virtual tour. Along Paseo Colon, named in honor of the intrepid Genovese explorer Christopher Columbus is the old Agriculture and Fishing Secretary. This neo gothic construction evokes the early 20th century Argentine wealth, when the country was christened the world's barn. The construction was directed by Vanelly& Sons and Kimbau & Company. A couple of steps to the right is an outstanding construction belonging to the University of Buenos Aires, one of the world's most respected institutions at the time it is one of the last public and free of charge ivy league schools in the world. The School of Engineering was built during the early 50s and before belonging to the UBA it used to be Eva Peron's Foundation. Just in front of the school is one of the greatest public works of art of our country. Entitled "An ode to Work", this is a monumental sculpture by Rogelio de Yrurtia (1879-1950), made in bronze and featuring 14 brilliantly achieved human figures. Crossing Paseo Colon to Defensa Street we head along Estados Unidos St we head towards the San Telmo yards, a typical 18th century of the area that holds artists and artisans, located in the San Lorenzo Path. At the corner of Estados Unidos St and Balcarce St. is BAR Sur a typical argentine café that opened its doors back in 1967 and was an avant-garde location in terms of night tango shows. It's still is, both for locals and visitors alike, for it presents a trustfully inspired show of the traditional music and dance of tango, as well as an inspiring atmosphere. A must for anyone who wishes to enjoy a traditional tango experience. Following our tour thru Balcarce St, at the number 1016 is the home of the famous Argentine artits Juan Carlos Castagnino, born in 1908 this artist was an outstanding man of arts who's widely known for his works of illustration for the Argentine best seller book Martin Fierro in the 1963 edition. Having passed away in 1972, his late 18th century home remains as a landmark of aesthetics and homage to his works. Next door to Castagnino's home is one other outstanding construction known as the Old Hotel, now transformed in Art Gallery and atelier for the neighborhood's artists and sculpture makers. The gorgeous construction dating from 1890 was originally a top notch hotel, today is part of the protected historical buildings of Old Buenos Aires. The first parallel street to the left of Estados Unidos is Carlos Calvo St, between Balcarce and Defensa is one very interesting building of the early 20th century, the Denmark Church. Carlos Calvo 257 is the precise address. Margarita daughter of a very prestigious man of Rosas was supposed to marry into society, but she was in love with a local artist, singer; a bohemian man of the arts that stole her heart. Margarita run away with her love but was caught by her arranged fiancé who shot her when she tried to escape. Margarita returned to her home and died a couple of days latter. Our walk along the historical buildings of San Telmo now takes us to Buenos Aires foreman Esteban de Luca's home, at the intersection of Defensa and Carlos Calvo St. The construction dates of the late 18th century. De Luca was a military, poet and journalist of a great time in our history, and because of his actions atop the historical aspects of his home it has now been turned into National historical Monument. Our next stop is a whole block delimited by Bolivar, Carlos Calvo, Defensa and Estados Unidos, home of the historical San Telmo Marketplace. Featuring a unique style of avant-garde modernity in the late 19th century, this construction evokes a cross influence of Italian style in the outside construction and a strong English -trainstaition/marketplace- like iron structure combining metal and glass into a smooth look. The Architect was Juan Antonio Buschiazzo and the Market is still functioning to our days supplying nearby neighbors and curious visitors from every day goods and groceries to fine antiques and collectibles. A one of a kind mix that somewhat comes together in a wholesome concept only in San Telmo. Walking along Defensa St is Plaza Dorrego, a gathering point for the neighbors that has been there for at least 3 centuries, home to local pubs, bars, cafes and a myriad of public shows, on Sundays the plaza transforms in outdoor flea market for the antique lovers and the passers by. Taking our right down Humberto 1 St to the number 378 is the Argentine Penitentiary Museum. The building is truly interesting, built in 1760, by the architect Antonio Masella it was originally targeted to be the Home of the Spiritual Army for men, but soon the Jesuit mission was taken off Royal jurisdiction, and it was then awarded to the Cabildo, the house of government during Colonial times directly dependant of the Spanish Crown. Inside the building is a Jesuit Chapel dating from 1734. Time passed and Argentina got its independence from Spain. The building was adjourned in Modern times to serve as Women's Penitentiary until 1978. After that, the city declared the construction as historical patrimony and it was transformed into a museum that opens daily. 1734 and was altered and transformed throughout the centuries until early 20th century is that the National Monument features a truly eclectic neo colonial style. The careful and trained eye, can try to discover the diverse influences from different times, but indeed it's a somewhat impossible task for the input was tremendous and the alterations endless. All in all, it's a beautiful construction that is currently undergoing a process of restoration, may be the conservation will provide a closer look to its original features. Open for visitations every day, except for when religious services take place. Across the street on Humberto 1 343 is the very first Medical School of Argentina. Today, the building holds a Public School: Escuela Guillermo Rawson. The first school of Medicine in Buenos Aires was opened in 1858. The construction features a neo colonial style, and an interesting note of color is that the front door magnolias have been there since the school first opened. Just a tip for the botanical lovers. Back to Defensa St, we continue our walk thru San Telmo's architectural monuments. On Defensa heading towards our left is Pasaje La Defensa, a brilliant construction of 1880, an era of splendor and growth for our nation, on the number 1179. This home belonged to the Ezeiza Family, a prominent society group which played a central role in our history during crucial times. Today the traditional two story construction is a gallery opened to the public. A couple of steps further to our left is San Juan Avenue, if we walk just a bit along San Juan to our left is the City's Government Museum of Modern Art. The huge brick walled building was a cigarette factory -actually a trademark of early Argentina Cigarettes 43- built in 1918 with an interesting input of British Utility Buildings aesthetics. The museum while undergoing thru a rehab process is open to the public daily. Back to Defensa St as we head off towards the gorgeous Lezama Park, on Defensa 1220 is the Museum of Film, which does not offer an outstanding architectural interest, is home to some very interesting movie collection and memorabilia. Opens Monday thru Friday from 10 AM to 5PM. On Defensa 1344 is a 1860 traditional house, that was saved from demolition by real estate magnate Osvaldo Giesso, it currently holds an art gallery and Theatre school. Following Defensa towards Brasil St, at the very intersection of these two streets is one of the neighborhoods most beloved and treasured cafes. The Bar Britanico, aka British Bar, whose owners were Spanish immigrants, but the area developed so much during the times when the British were establishing the railway system, that they finally christened their shop in honor to the area's progress. This is as traditional as it gets in terms of Buenos Aires cafes, plus the view of the park is just brilliant, so don't miss it. To our left, following the park's barrancs is a great monument of unparallel architecture in the area: The Russian Orthodox Church of the Holly Trinity, on Brasil 315. The 17th century muscovite styled church was actually built in the early 1900, with the coordinated efforts of The Holly Synods of Russia Mihail Preobrazensky and architect Alejandro Christophersen. The detailing of the construction is outstanding and its finest highlight is the Venetian mosaics representing the Holly Trinity custom made in Saint Petersburg. The Lezama Park is an immense green space in the heart of the Southern District of the City, located in a natural barranc that is believed to have been the first original location of the first founding of the City of Buenos Ayres. The Park is also linked directly to one of the city's most important historical events, which are the repellence of the English invasion in 1806; the place where the local forces defeated the invading ones was precisely the Lezama Park. Years after, the British relocated David MacKinley built his weekend Riverside House, soon it was christened the English House. By 1857, the property was bought by a Salta Business man Jose Gregorio Lezama, he forested the area with exotic plants and tree. By 1889, his widow sold the property to the community to transform it into a public area under the name of her late husband. Demolished 19th century houses fittings for sale and rare architectural items from Iron doors to wooden windows. Argentina, Buenos Aires Historical Quarter as well as all major Cities, .... full of demolished buildings with interior fittings from demolished 19th century houses for sale at some of the building materials recycling warehouses. 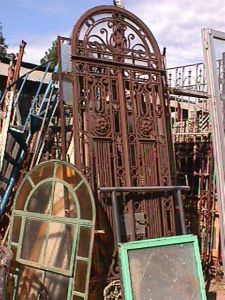 Mostly wonderful fireplaces, window, doors, screens, light fittings, bronze fittings for doors and windows salvage- like building details, building elements like stair rails, windows, hardware, and plenty more! Bob Frassinetti: For more information: Email: Bob Frassinetti. Press here to go back to web blog:Daily Updates on Art, Antiques, Collectibles as well as travel information for Buenos Aires, Argentina. Phone me thru Skype, ID: Bob Frassinetti or you can also chat with me thru Yahoo, press here: Yahoo Contact Find me on MySpace and be my friend! 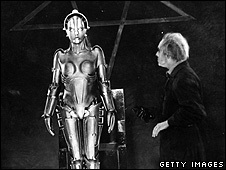 Lost scenes from the classic sci-fi film Metropolis have been shown for the first time in decades. The long-lost original cut of Fritz Lang's 1927 silent film was discovered in the archives of the Museum of Cinema in Buenos Aires earlier this year. The museum's Paula Felix-Didier said it was the only copy of the complete film. Metropolis depicts a 21st Century society divided between a class of underworld workers and the "thinkers" above who control them. But a private collector carried an original print to Argentina in 1928, where it has stayed, Felix-Didier said. In the 1980s, Argentine film fanatic Fernando Pena heard about a man who had propped up a broken projector for "hours" to screen Metropolis in the 1960s - but the version of the film he knew was only one-and-a-half hours long. For years, he begged the Buenos Aires' museum to check their archives for the man's longer version. In June, Felix-Didier flew with a DVD to the Friedrich Wilhelm Murnau Foundation in Wiesbaden, Germany, which owns the rights to Metropolis. They confirmed that the extra scenes were from the original. "We were overjoyed when we heard about the find," Helmut Possmann, head of the foundation, told Reuters. "We no longer believed we'd see this. Time and again we had had calls about supposed footage but were disappointed." Around 20 to 25 minutes of footage that fleshes out secondary characters and sheds light on the plot would be added to the film pending restoration, Possmann said, but around 5 minutes of the original was probably still missing. Released in 1927, the silent film was not a commercial success and nearly ruined the studio behind it. Soon after its premiere, the movie was heavily cut to make it more accessible, and several new versions of varying lengths emerged. De este modo podrá finalmente ser reconstruida la obra de Lang, el maestro de todos los filmes de ciencia ficción, y presentarlo de nuevo a todo el mundo", dijo a la agencia noticiosa alemana Ansa el presidente del Comité Directivo de la Fundación, Eberhard Junkersdorf. 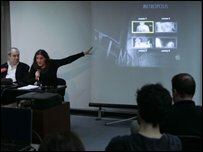 Télam pudo saber que el hallazgo fue obra de la investigadora Paula Félix Didier (nueva directora del Museo del Cine porteño Pablo Ducrós Hicken), en colaboración con Fernando Martín Peña, periodista y director del área de cine del Malba. Las escenas recuperadas muestran un trayecto en auto por la "Metrópolis" que Fritz Lang concibió como ciudad del futuro y la relación entre tres personajes secundarios. Las primeras observaciones del material hacen suponer que, pese a la baja calidad de las imágenes, se podrá reconstruir la obra maestra de ciencia ficción rodada entre 1925 y 1926. Un despacho de la agencia DPA repasó que el clásico fue estrenado en su versión completa el 10 de enero de 1927, pero pocos meses después la película ya sólo fue exhibida en versiones abreviadas. más- que la versión abreviada alemana y estadounidense.